I want to thank the wonderful people over at Hachette Audio and Libro.fm for an ALC of ‘Friendly Fire’ in exchange for an open and honest review. Receiving this ALC in no way, shape, or form influences my thoughts or opinions on the novel. 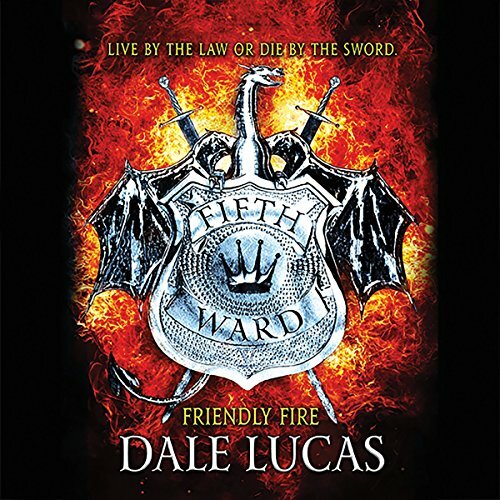 I also want to give a shoutout to the author, Dale Lucas, and the narrator, Simon Vance, for another very entertaining adventure in The Fifth Ward. Friendly Fire, while maybe not giving me everything I hoped for after Book 1, is still a highly enjoyable, fast-paced romp through the streets of Yenara and is perfect for fans of the Netflix original ‘Bright’. Rem and Torval are back at it again with another head-scratcher: an interesting case of arson that is at the forefront of several brutal murders across the city. It is up to this good cop, bad cop duo to dive to the bottom of Yenara’s constant pit of problems to uncover the reason behind these murders and who is responsible. The only thing standing in their way is a war between humans and dwarves, and an ancient creature brought to life to end it all. Though not quite on par with its predecessor, which quite a few sequels tend to fall into that category, I still enjoyed my second trip to Yenara and am glad Rem and Torval invited me for another ride-along. Rem and Torval’s relationship has progressed a ton since Book 1, and it is nice to see that their ‘Training Day’ days are over. Though both are still as hard-headed as they come, they care a lot for one another and always put the other first. While we didn’t get to explore an even larger part of Yenara than I had anticipated, the story still flowed well and did not feel claustrophobic. The addition of Rem’s romantic relationship was nice and it allows Rem to spill on his backstory a tad, though it felt a little bit filler-ish in all honesty. All in all, if you read Book 1 and enjoyed it, you’ll more than likely grab Friendly Fire in order to catch up with Rem and Torval. If you haven’t given these books a shot, but you enjoy some light-hearted fantasy mixed with a buddy cop movie, I highly suggest picking them up. I’m very much looking forward to Book 3 as I feel that Lucas is building up to something spectacular.